In October, a major study claimed that huge reductions in meat consumption are essential to avoid a climate-related catastrophy and reverse a global obesity epidemic. It warned that if meat consumption does not fall by 90 percent, it could result in unsustainable levels of global warming, deforestation and water shortages. 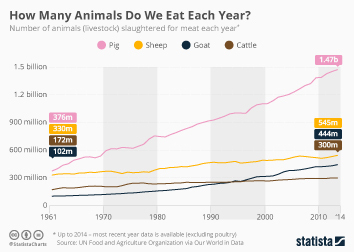 Given the findings of the report, which countries eat the most meat each year? 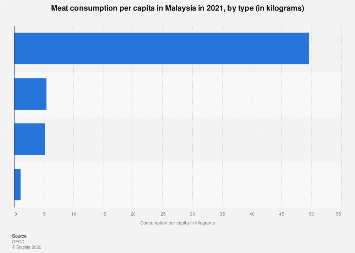 According to UN Food and Agriculture Organization data reported by website Our World in data, Australia is the top of the global meat-eating league with 116 kg consumed per capita every year. 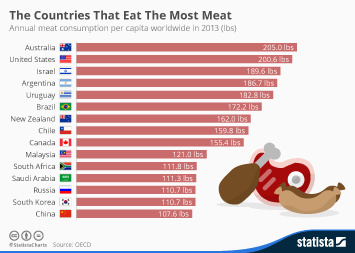 The United States isn't far behind with 115 kg consumed annually. 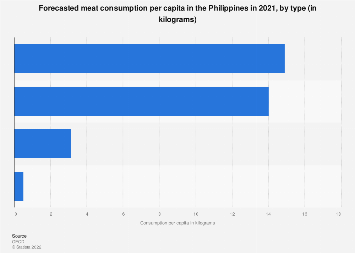 This chart shows total per capita meat consumption worldwide in 2014 (in kg).